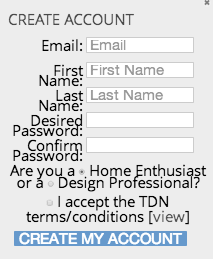 3 Easy Steps To Subscribe to My TDN Video Channel! I’ve been getting a lot of requests for *How To* subscribe to my video channel on The Design Network. This post explains it in 3 easy steps for you. Create a quick log in account, which takes just a minute – similar to what you do on any other site. When you click the big blue button in the screenshot above, this is the screen you will see. Fill this out and click the blue button that says, CREATE MY ACCOUNT, that you see below. Once your account is created, enter my name, Mitzi Beach, in the search bar on the upper right of the home page [ you can see the search space below -it’s right under where it says MY TDN and LOG OUT ] and, after you enter my name and click the little search icon next to it, you will be taken to my channel where you then just click the SUBSCRIBE button. Now that you’ve subscribed, as you watch my videos, you will be able to take actions on them, too. You can see how those appear on the screenshot below. If you see a little *i* on the bottom of the pop out, you can click to get more information. If you see a little shopping cart on the bottom right of a pop out, click it to buy what is being shown in the pop out. 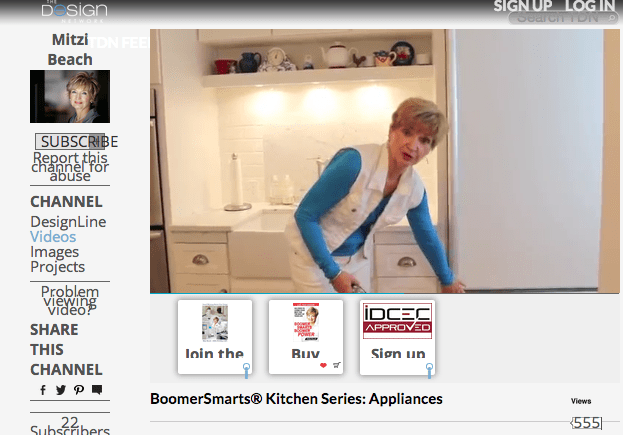 In this case, as you see below, the shopping cart icon is on the video pop out for my book, Boomer Smarts, Boomer Power. If you click it, you’ll be taken to Amazon to make it fast and easy for you to purchase it. From my video channel, you can click my social media icons on the upper right to connect with me on my other social media channels on Twitter, Facebook and Pinterest to ask me a question or leave a comment. 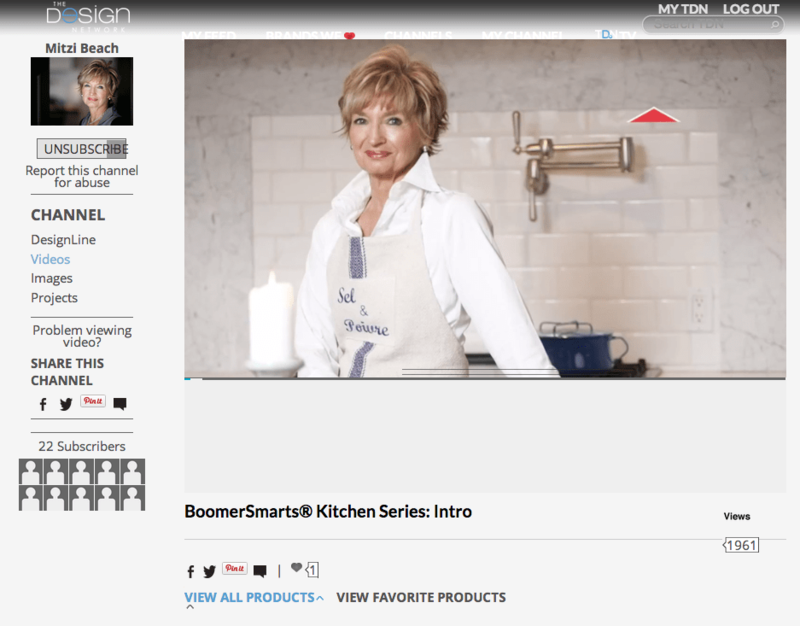 I hope you will enjoy watching them as much as I enjoy making them for you – to share with you practical ideas and products that make your own homes #BoomerSmarts – homes that change with your evolving needs so you can stay in them as long as you would like. If you run into any difficulties or need any more help in subscribing, please don’t hesitate to email me at mitzibeachdesigns@gmail.com. I look forward every day to seeing your comments on my videos and invite you to visit my Facebook Page at http://facebook.com/MitziBeachFans , too, where every Saturday is #BoomerSmarts Saturday with a new video for you to enjoy. This entry was posted in Design, Lifestyles and tagged BoomerSmarts Wisdom, Mitzi Beach, Mitzi Beach Design, The Design Network. Bookmark the permalink.